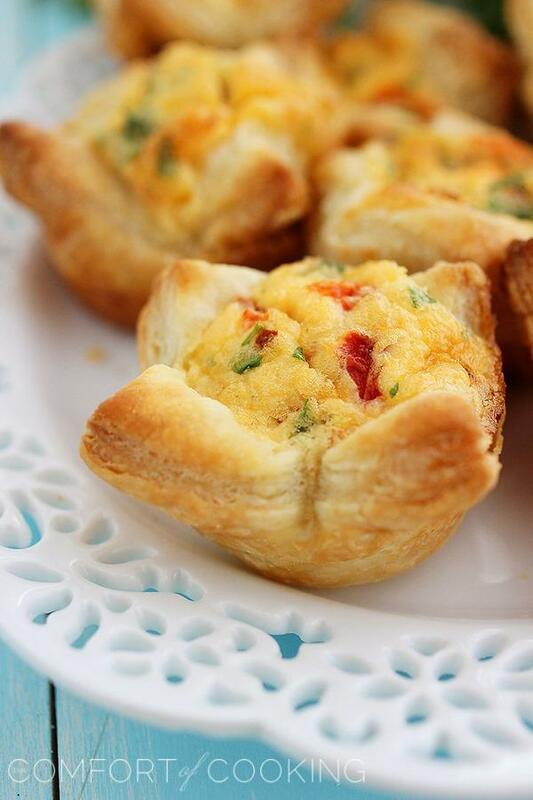 Bake a batch of mini puff pastry quiche for Mother’s Day, or for a special spring brunch any weekend! It’s sometimes tough to live such a far distance from my family. Especially on days like Mother’s Day, I wish I could just make a big pot of coffee and sit down to a warm home-cooked brunch with my mom. I know she would love that so much more than any necklace or perfume! These mini quiche may look small, but they pack major flavor. With roasted red peppers and fresh herbs, every bite is lil’ bit of bliss! Not only are they ridiculously easy, but they’re perfect for every one of life’s little occasions, big or small! Make these beautiful little bites for your mom this Mother’s Day, or anyone special in your life. They’ll love these perfectly crispy, pillowy soft puff pastry quiche for brunch, and you will too! For lots more breakfast and brunch recipes, click here. You can also see my tips, below, on how to keep springtime entertaining quick and easy! Preheat oven to 400 degrees F. Lightly coat cups of a mini muffin pan with cooking spray. In a medium bowl, whisk all ingredients together up until puff pastry. On a lightly floured surface, unfold pastry sheet and roll into a 12-inch square. 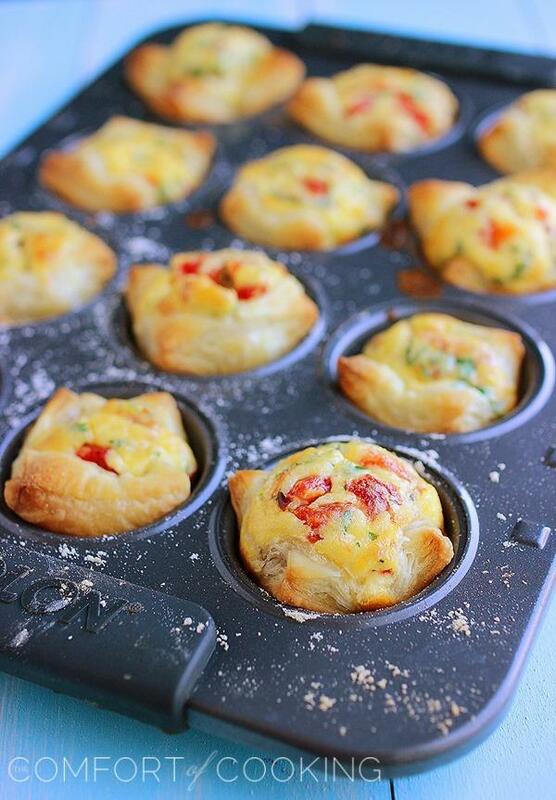 Cut into about 20 (2-inch squares) and press each square into a mini muffin pan cup. Spoon about 1 tablespoon egg mixture into each cup. Bake for 12-14 minutes, or until the filling is set and quiches are golden brown. Let cool in pans for 2 minutes before removing to a serving platter. The trick to making brunch as effortless as possible is to opt for make-ahead or simple dishes. Look for an easy casseroles or coffee cakes, which allow you to prepare everything in advance, or salads, which can be made while catching up with guests. With airy accents like fresh flowers and white linens, any spring party can feel effortlessly elegant. Also try pitchers full of lemons, clementines and limes for a colorful, unexpected burst of color! Whip up an easy but impressive flavored butter by mixing one stick of butter with 1/4 cup jam or honey and 1/4 teaspoon pure lemon or orange extract. For a more savory option, mix one stick of butter with 1 teaspoon each of garlic powder, Italian seasoning and ground mustard. These are lovely! What a sweet idea for brunch. Such an awesome brunch recipe! This is right up my alley. Pinned! How pretty these look! I think I might try them this weekend to take to a friend’s party. I love these little puff pastry quiche bites. They look amazing! These look so so so good!! 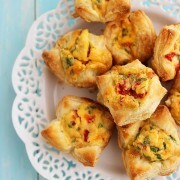 I love puff pastry and it goes perfectly with eggs and cheese!!! YUM! These look like little bites of DELICIOUS! I love this as a brunch idea – what irresistible bites! I’m a puff pasty addict and this is going to be made for Sunday breakfast! Thank you. What little beauties Georgia! I bet they just melt in your mouth! They’re so elegant. I love them. I live far away from my family too so I know how you feel! 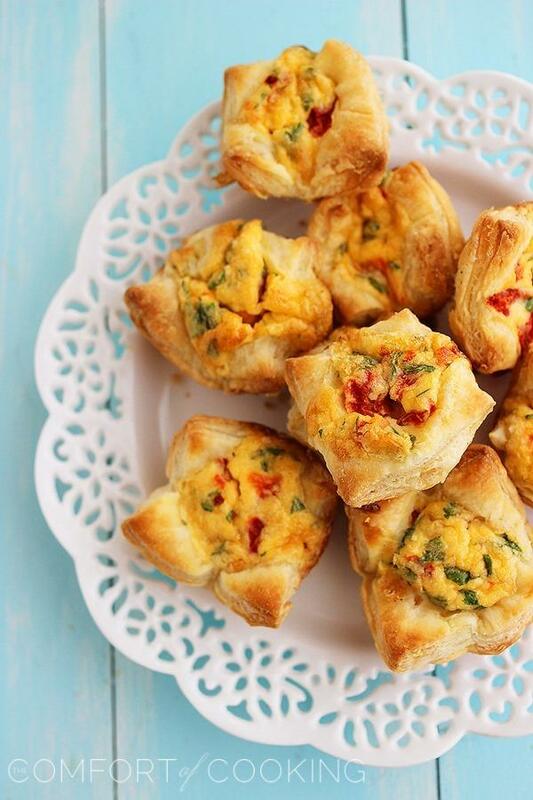 These little quiches are so cute and they look delicious! Perfect brunch food! OH my goodness, this looks absolutely delicious!!!! I definitely need to make this. Georgia – this looks so gooooooood and easy to make. Sucha great idea. Love the addition of red peppers. These are beautiful!! What a perfect appetizer now that summer is finally coming around! These look so puffy and delicious. My husband would love this for the dinner, with a cold beer or a glass of chilled white. I love these mini bite dishes, especially this season! Thanks for sharing! These look incredibly tasty! Love your pics! Absolutely perfect for Mother’s Day brunch. Lovely! Can these be made ahead of time and reheated? Perhaps even frozen? I would love to make these for a party but I won’t be able to cook them day of! Can the ingredients sit in the fridge prepped in the tray and then just popped in the oven the next day? I would try to bake day-of, if possible. If left overnight, the puff pastry may become soggy. I suggest doing all prep up until baking, then baking next day. and am nervous about switching to another platform. I have heard fantastic things about blogengine.net. quite a bit up fast! What web host are you using? I know this site gives quality based articles and extra information, is there any other web page which gives such information in quality?